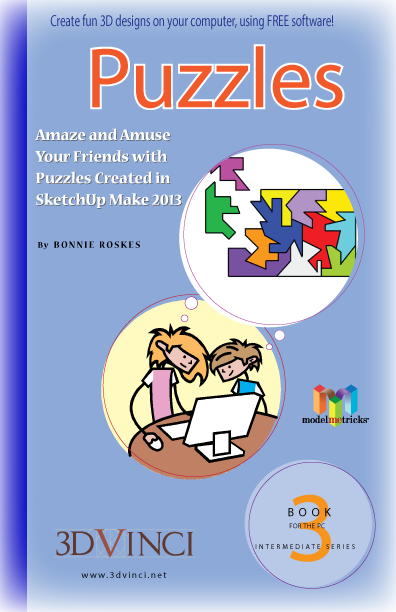 In this third book of the ModelMetricks Intermediate series, you will make puzzles that you can give your friends to solve. There are shape puzzles, picture puzzles with different types of pieces, word puzzles where your friends can unscramble a message, and even a spinning message puzzle. You can make your puzzles easy to solve, or you can drive people crazy with tough ones! View chapter details. Printable PDF format, 8.5" x 11", 90 pages; download info will be sent within one business day. Buy the 4-book ModelMetricks Intermediate Series and save!